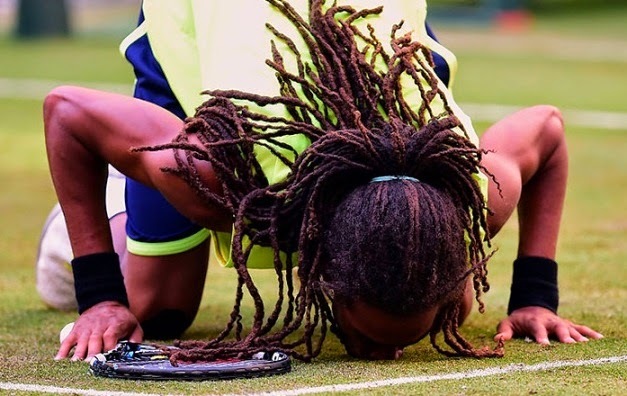 This morning I had posted of this man sinking to his feet, nicknamed "Dreddy" because of his dreadlocked hair he was basking in glory having packed off Rafael Nadal…. The venue .. the Halle Open, held in Halle, North Rhine-Westphalia, Germany. Held since 1993, the tournament is played on four outdoor grass courtsand is a part of the ATP World Tour 250 series on the ATP Tour schedule. Four days after winning a record ninth Roland Garros title, the World No. 1 Rafa fell 6-4, 6-1 to an inspired Brown in the second round of the Gerry Weber Open. Very recently, I had posted about Andy Murray making a comfortable start to the grass-court season in front of new coach…………. as he beat Paul-Henri Mathieu in straight sets at the AEGON Championships. The Brit took one hour and 26 minutes to beat French world 92 Mathieu 6-4, 6-4 in his first match at the Queen's Club as he prepares for the defence of his Wimbledon title. His new coach was discreetly seated a few rows back ….. last year he had Ivan Lendl. the great Czech with minimal coaching experience, and set a trend that many of his rivals would follow for big-name hirings. This year- Andy Murray startled people announcing Amelie Mauresmo as his new coach, ahead of his Wimbledon defence later this month. Brown’s victory run was cut short sooner …. Philipp Kohlschreiber remains on course to lift his fifth ATP World Tour title on German soil after he beat compatriot Dustin Brown, 6-4, 5-7, 7-6(16), on Friday for a place in the Gerry Weber Open semi-finals. Kohlschreiber recovered from a 2-5 deficit in the tie-break and saved five match points at 6-7, 8-9, 10-11, 12-13 and 14-15. The match lasted two hours and 11 minutes. “I don’t think I’ve ever had such a long third set,” said Kohlschrieber. “It was a mere war of nerves [and] unbelievable tension. It was very exhausting to keep calm, stay cool and maybe even enjoy it. Kohlschreiber, the 2011 Halle titlist, recorded his 27th win in 35 matches at the ATP World Tour 250 grass-court tournament and will next face Alejandro Falla. Earlier in the day, Falla, the Colombian edged past German wild card Peter Gojowczyk, 7-6(4), 7-6(2) in one hour and 46 minutes. Away, World No. 42 Radek Stepanek upset three-time former champion and home favourite Andy Murray 7-6(10), 6-2 on Thursday to reach the quarter-finals of the Aegon Championships at The Queen’s Club. Stepanek recorded his first Top 10 win in nearly two years and the 24th of his career (24-71 record). The Czech advances to a quarter-final clash with Kevin Anderson, against whom he has a 1-1 FedEx ATP Head2Head record. "Beating him is actually a great win for me," said Stepanek. "When you play the best ones, you're going to come out with your best. I think that's what I did today. Definitely it's special to play on grass in England after he won Wimbledon and he won the Olympics here." The 27-year-old Murray was defending his title at this ATP World Tour 250 grass-court tournament, which he won in 2009, ’11 and ’13. The Scot, who reached the Roland Garros semi-finals last week (eventually losing to Nadal), dropped to a 27-11 match record on the season. He suffered his first grass-court defeat since the 2012 Wimbledon final against Roger Federer. He had won 19 matches in a row on grass. Roger Federer took time out from his preparations for theGerry Weber Open, where he is a six-time champion, to visit the Bethel children's hospital in nearby Bielefeld on Monday morning. Federer, who had a living room named after him at the hospital last year, told ATPWorldTour.com, “I am happy to be back here one year later and to see how things are developing for the children. It is really important to me, as helping children is also a major part of my foundation work.The Gerry Weber Open, a recipient of an ATP ACES For Charity grant in 2012, donated € 10,000 for a kitchen to be built in the ‘Roger FedererLiving Room’. The children's cancer clinic has four other treatment rooms named after Michael Kohlmann, Alexander Waske, Mischa Zverev and Marco Chiudinelli, who also made visits in recent years.